I went to see the orthopedic surgeon yesterday at Medical City Dallas. My finger is healing great and I do not have to go back. 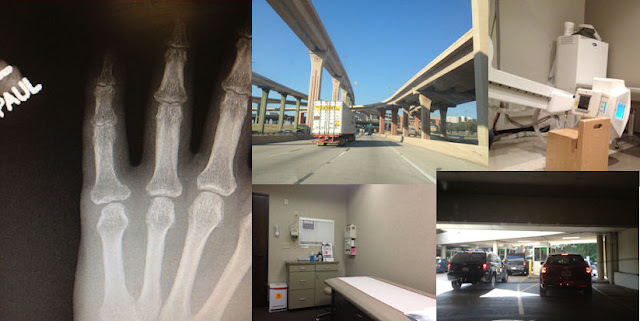 I will not miss the high five, traffic, the x-rays and the exam rooms. Now if I can act my age and not like a 20 year old I should be ok.
Friday days football scrimmage between Sulphur Springs and Terrell has been moved up 30 minutes. The Varsity is now scheduled to start at 6:30. The scrimmage will be at Memorial Stadium. There's a new cowboy on the rodeo circuit and hes from Terrell, TX. Tyler Wade, who just turned 20 in June, is in the top 15 in the PRCA World Standings for Team Ropers (headers). Tyler is on pace to win the Team Roping rookie of the Year and could be on his way to the National Finals Rodeo in December held in Las Vegas. Here is a link to the current standings. Clayton Hass, also from Terrell, is currently in 17th place in the All-Around World Standings. Great job by both cowboys.